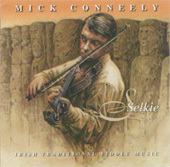 Those who have heard Mick's fiddle playing before are likely to remember his gutsy, intense, style of playing, admittedly influenced by that of Frankie Gavin, with whom Mick shares a penchant for "self-accompaniment" with much double-stopping as well as tricky bow work, and those who like it will enjoy greatly the music on "Selkie." The album was recorded live and analog in a German studio, with bouzouki accompaniments by Niall O'Callanain, and a guest appearance by Mick Conneely Sr. on fiddle. Mick's choice of tunes, a nicely balanced combination of old standards and newer tunes, provides the perfect vehicle for a great display of his abilities as a player and as an improviser. Although it is difficult and unfair perhaps to single out one track over the others, the hornpipes "The Showman's Fancy" and "Flee as a Bird" stand out in my mind for the sheer virtuosity of Mick's playing, while the reel track "The Glen of Aherlow/The Bear Island Reel/The Green Fields of Glentown" makes a brilliant medley played with great flair. Mick's acknowledgement of his debt to the tradition is expressed through having his father, Mick Senior, play on a couple of tracks, one in duet with his son, and another where Mick Junior accompanies his father on bouzouki, Alec-Finn-style. You can definitely hear where Mick Junior got a lot of his music, as his father's playing would deserve an album all of its own.